The potential of digital games in the second and foreign (L2) classroom is enormous but harnessing their potential for application in the L2 classroom, however, presents complex challenges. 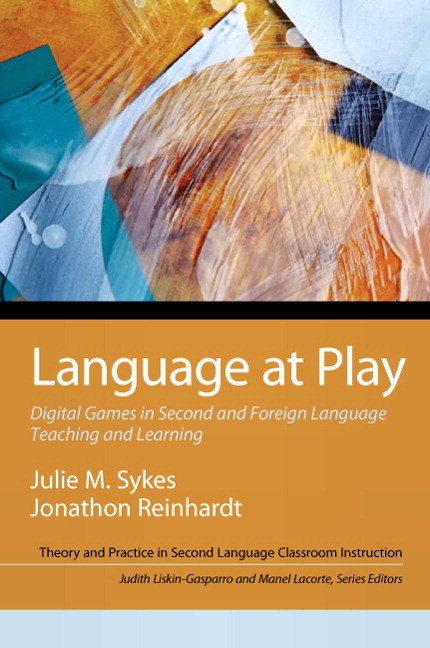 In Language at Play: Digital Games in Second and Foreign Language Teaching and Learning, Sykes and Reinhart combine research from a variety of perspectives in applied linguistics, educational gaming, and games studies, and structure their discussion of five major concepts central to these areas: goal, interaction, feedback, motivation and context. While theoretically grounded, the volume's audience is primarily practicing L2 professionals with classroom experience. Intended for current and future foreign language teaching professionals, volumes in the Theory and Practice in Second Language Classroom Instruction series examine issues in teaching and learning in language classrooms. The topics selected and the discussions of them draw in principled ways on theory and practice in a range of fields, including second language acquisition, foreign language education, educational policy, language policy, linguistics, and other areas of applied linguistics. In this book, readers will find theoretical discussions and practical examples relevant to digital games for seond language teaching and learning. Each of the five body chapters discusses a concept central to L2TL and familiar to practitioners and researchers ( goal, interaction, feedback, motivation and context). · Scenarios. An opening scenario and game-mediated scenario are included in each chapter to contextualize the main concepts and present the issues from a variety of perspectives including teacher, students, and administrator. · Reflection Questions. Questions for consideration are included after each major section of the chapter and encourage readers to explore these questions prior to moving forward with the next section. · Summary and Implications. At the conclusion of each chapter, the authors highlight the main ideas that have been presented. · Game-Mediated Activity Examples. Activities that can be used in second language teaching and learning are included with the intention they can be used with adaptation on the part of the instructor or researchers. Activities from a game-enhanced, game-based, and game-informed perspective that highlight the main concepts from each chapter are offered. · Suggested Readings. For further reading at the end of each chapter. These are annotated to help the reader select the resources most relevant for their own interests. Wherever possible, the authors include one reading from L2TL theory, one reading that specifically addresses game-mediated L2TL, and one from games studies research. · Appendices. Three appendices are included to add additional details related to the concepts central to the book. Appendix I: Glossary presents definitions of the boldfaced concepts and terms included throughout the book. Appendix II: Guide to Game Types and Genresis a summary of the most popular digital game genres and types. Appendix III: Digital Game Evaluation Guide for L2TL offers an evaluation guide for the selection of digital games based on the central premises of each of the main chapters. Julie Sykes is currently Director of The Center for Applied Second Language Studies at University of Oregon. She received her Ph.D. from the University of Minnesota with a focus on applied linguistics and second language acquisition. Julie's research focuses on the use of digital technologies for language acquisition with a specific focus on inter-language pragmatic development and intercultural competence. She has taught courses on second language teaching and learning methodology and research, language learning and technology, Hispanic linguistics, and inter-language pragmatic development. In addition, she has supervised large language programs. Julie's experience includes the design, implementation, and evaluation of online immersive spaces and the creation of place-based, augmented reality mobile games to engage language learners in a variety of non-institutional contexts. She has published various articles on CALL-related topics, including synchronous computer-mediated communication and pragmatic development, gaming and CALL, and lexical acquisition in digitally mediated environments. Julie also holds a faculty appointment in the Department of Romance Languages at the University of Oregon. Jonathon Reinhardt is an Assistant Professor of English Language/Linguistics at the University of Arizona, where he is Director of the MA in TESL program, affiliate faculty in the interdisciplinary PhD program in Second Language Acquisition and Teaching (SLAT), and co-director of the Games to Teach project at CERCLL with Julie Sykes. His research interests focus on socially-informed approaches to technology and L2 pedagogy, specifically digital gaming, digital L2 literacies, social networking and new media, and technology-mediated interaction. He has taught EFL in Austria and Japan, ESL in Chicago and Pennsylvania, and received his Ph.D. in 2007 from Penn State University. When not teaching, writing, or exploring new game-mediated worlds, he enjoys technology-free hikes in the Sonoran Desert.